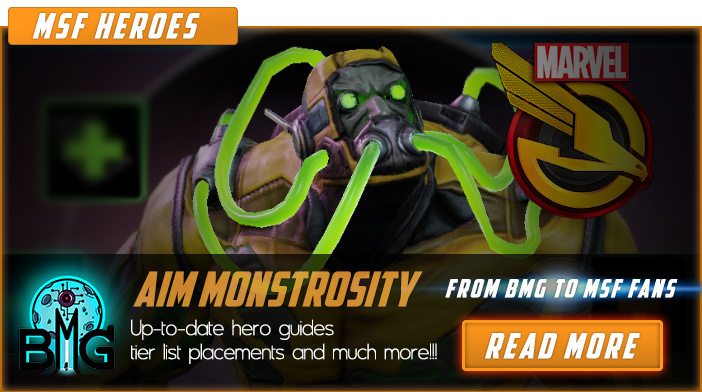 Welcome to Marvel Strike Force Minions page. This is the full description of MSF A.I.M. Monstrosity stats, skills and abilities. In Marvel Strike Force, A.I.M. Monstrosity is an A.I.M. minion who delivers enormous damage to the enemy. Advanced Idea Mechanics aka A.I.M. is a secret branch of Hydra organization made of ingenious, inventive scientist and their sidekicks who devoted their lives to achieving a technological means to rule the world and overthrow foreign governments. In beginning the sole purpose of A.I.M. was to create super weapons for Hydra but later they separated from Hydra due to political differences and started their own agenda. A.I.M. invented three deadly devices – Cosmic Cube capable of altering reality, Super-Adaptoid capable of mimicking other beings superpowers and MODOK, (Mental Organism Designed Only for Killing) human with the gigantic head capable of delivering psionic bolts from his brain. Over the years, the leader of A.I.M. was Scientist Supreme but after he was killed by MODOK leadership was transferred to his killer. Along with A.I.M. Infector, A.I.M. Monstrosity is the most expensive minion in the game with a price of 100 shards. He can be obtained through premium orbs, blitz orbs, and blitz supplies. A.I.M. Monstrosity has the highest base damage of all heroes and minions in the game except Iron Man who has the same base damage. This gargantuan character has the chance to lower enemy defenses while attacking and he can heal himself for moderate amount while buffing himself with Offense Up (although he debuffs himself with Defense Down at the same time, it is still a very powerful combo). Additionally, he has the passive ability which gives him 40% chance (when upgraded) to heal himself for a small amount every turn. A.I.M. Monstrosity's main weakness is his low speed but if he is protected well he could be a killing machine. A.I.M. Monstrosity is a massive brute that gains strength at the expense of vulnerability. We hope that you enjoyed the description of MSF Minion A.I.M. Monstrosity. For detailed information about other MSF Characters check our MSF Minions page.